Microids and Frima shared new information about the Switch title Super Chariot today. The news is highlighted by a launch month: May 2018. 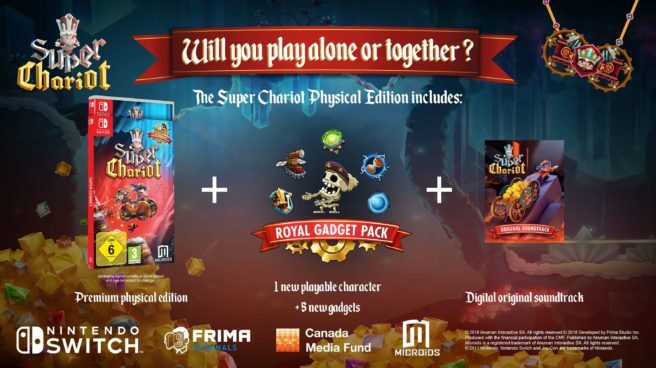 Super Chariot will be sold physically, though only in Europe and Australia. It’ll include the game, the Royal Gadget Pack DLC, and the original downloadable soundtrack. That’s not all for Super Chariot. Microids says a demo is coming “soon” and will include the first three levels. Players take on the role of the princess or her fiancé as they set out to take the coffin of the deceased King in search of a resting place deemed worthy by His Late Majesty. They will have to use all their wits to manoeuvre their chariot through 25 colourful levels. Fully playable solo, this fantastic adventure provides, above all, hours of fun for two in co-op mode. Coordination and mutual help will be essential to move the chariot onward and overcome the obstacles that lie in the path of the two players!